When the temperatures drop I only dream of apple desserts. And sometimes pumpkin desserts. But mostly apple desserts. Like this Teresa’s Vegan Apple Cake. You may be wondering how I could dream of something that is vegan. It’s one of my favorite cakes!! My mother-in-law Teresa’s apple cake is amazing! I used to make it often because we all love it. It’s FULL of butter and lots of eggs. I lightened it up by veganizing it. I am not sure Teresa would be thrilled with this version and certainly would ask me why I’m baking without butter. Luckily, she doesn’t read my blog. 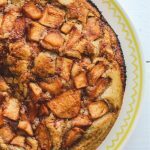 Teresa’s Vegan Apple Cake is a moist cake full of chunks of apples soaked in limoncello, cinnamon, and ginger…this cake is is a keeper! I make an apple cake at least once a week when it is apple season. You may be wondering how do you make a moist apple cake? I like to soak the apples in the spices and the lemon juice (or Limoncello). Cooking the apples in this spice mixture for a few minutes really softens up the apples. I find that using coconut milk really makes the cake more moist and soft. You know, it’s not easy “posing” a warm cake that just popped out of the oven. The temptation to just stick a fork in it and eat the whole thing is something fierce! It’s especially awful when you are trying to photograph said cake on an empty stomach. I take deep breaths and remind myself to just do the job. Take the photo. Quickly! The quicker I can get a decent shot, the quicker I can have that first bite. But you see, the problem isn’t actually holding myself back from attacking the cake. It’s my kids. And Luca has sneaky little hands. He’s good. He’s really good! When I turn around to grab something for the photo, he’s already jumped up from the chair and messed with my cake. He grabbed a piece of apple from the slice and then told me to take pictures of his cars. Flustered and totally distracted, I have to photograph him and his cars and suddenly the apple cake photos are just not as important any more. I can’t say no to this little smile. My mother-in-law Teresa’s apple cake is amazing!I made a vegan version of her typical Italian apple cake. A moist cake full of chunks of apples soaked in limoncello, cinnamon, and ginger…this cake is a keeper! Perfect for breakfast, snack time or as a special dessert. Sauté’ the apples in a skillet on medium heat for about 5-7 minutes. The apples will start to get tender. The spices and sugar will melt around the apples and it will be hard not to eat that mixture right out of the pan! Set the pan aside and let it cool for a few minutes while you prep the other ingredients. In a small bowl, add the coconut milk and apple cider vinegar. Mix together and let sit while you prep the other ingredients. In another large bowl, sift together the flour, baking powder, and sea salt. In a small bowl, mix together the Ener-g egg replacer and the warm water. Add the Ener-g egg replacer (or eggs), the oil, sugar, and vanilla to the coconut milk/apple cider mixture and stir together until all combined. Add the flour mixture to the wet ingredients a little at a time. Scrape the sides of the bowl and mix well after you add each portion of the dry ingredients. Pour half of the batter into your prepared tube pan. Spread 1/2 of the apple chunks evenly around the batter. Spread on top of the apples the rest of the cake batter and then spread on top of the batter the rest of the apple chunks. Bake for about 40-50 minutes or until a skewer inserted in the middle comes out clean. Depending on the size of your tube pan and your oven, check the cake after 30 minutes. When the cake cools, carefully invert it onto your serving plate. Serve warm with powdered sugar sprinkled on top or a scoop of your favorite ice-cream. Such a pretty cake. I'm loving all the apple goodness. Such a wonderful dessert for fall. This cake is beautiful. Love your photos. Stunning cake – love the vegan touch. whoohoo for vegan baking!!! i LOVE this cake recipe, since it doesn't have butter or eggs! i want to try making this gluten free! 😀 welcome to the #applelove bloghop party as a hostess :). haha and i agree, photographing is NOT easy when you are hungry. i usually have my puppy lingering by…watching my food. haha. have a great day Lora. How beautiful! This is perfect for the fall. Yum! Your apple cake is gorgeous, amd I love the apples in the lemoncello:) Luca is so cute! What a beautiful apple cake! Perfect for the season. Lovely Lora! Cake looks gorgeous! Perfect for fall. If I could I would have come over right now for my share! Your apple cake looks amazing and I cant blame Luca for trying to sneak a piece! Vegan or no – that looks absolutely divine. Teresa's cake still looks really, really good, even without the butter. I love the warm spices in there, such a perfect dessert for fall. And that Luca of yours is so adorable, I'd forget about any cake too if he was anywhere around me! Mmmm….this cake sounds so yummy! Love the photo with the car in it, and your little taster looks pretty cute too! I took my apple crisp outside to take pictures, and got one photo with my dogs snout in it :-). #applelove desserts are hard to resist! What an awesome adaptation – and you are lucky she doesn't read this, lol! I always have to watch what I say – Handsomes sister, father AND uncle read mine! (No pressure!!!). 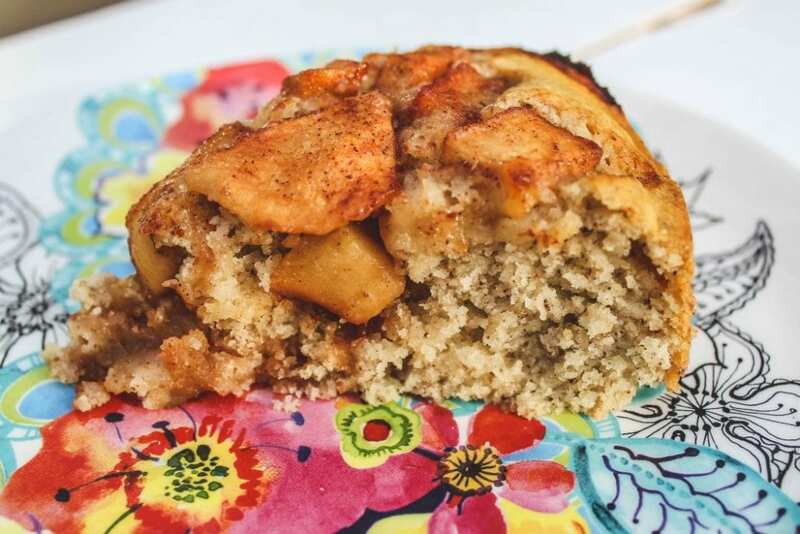 This apple cake totally looks sneak a bite worthy – and really, its rather adorable of your little man to do just so! What a sweet story Lora, your son is a little stinker, as we would say in my family. 🙂 The cake looks fabulous; nice and light and moist. Yum! Adorable and I love the pics! Love them! Especially the one with Luca peeking in. And love this cake. Wowee! 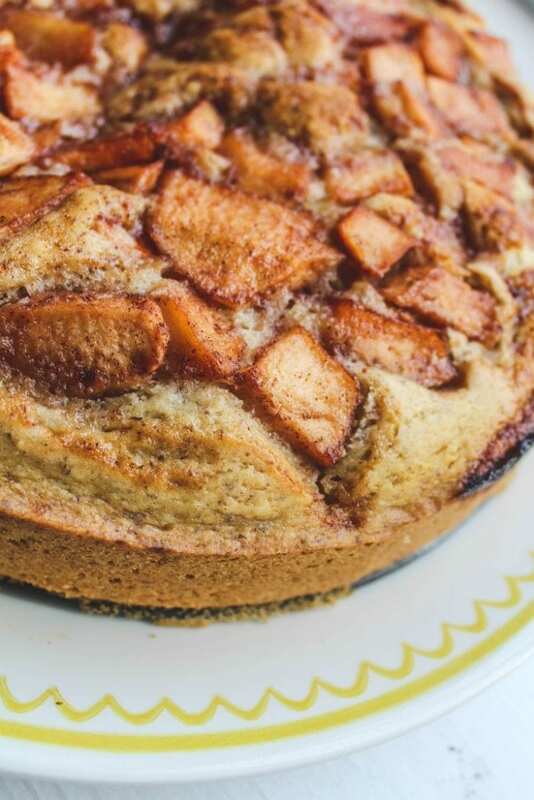 We love apple cakes and apple desserts so I just have to try this yummy one! Lora, i just LOVE this . . . yes, Teresa's cake is absolutely FABULOUS . . . but you are correct . . . one smile, one little car . . . one little hand . . . and suddenly the cake isn't important anymore . . . I can so relate to you with kids and food photography. My younger one takes the props and moves them and plays with them. But she is my helper too. The moment I start putting plate on the table, she gets me the tripod, bouncing foam boxes. But 'are you done?' can I eat it now? kills me sometimes. Very nice cake. I can't blame Luca either, this cake looks so delicious, it is irresistible. I wish I could taste it right this moment. Thanks for sharing the recipe. 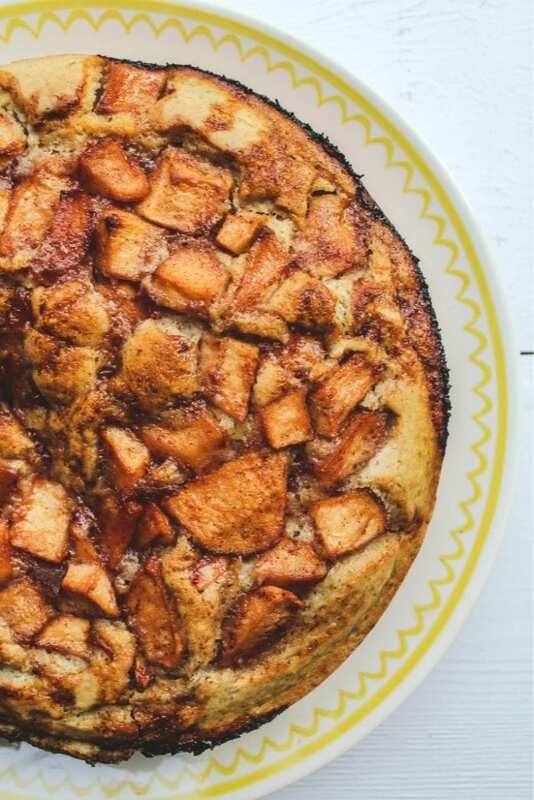 Oh my this Apple Cake is so tempting! I love the topping! Gorgeous pics! Glad to bake along with you on this BlogHop! This apple bloghop is such a fun idea! And that cake – not that just screams "autumn". I know what you mean about getting the perfect shot while the family is hungrily waiting for a bite – it's definitely a challenge. It really looks delicious…. or I should say mouthwatering! I see 2 lbs of apples listed twice in this recipe. Is it 2 lbs or 4 lbs? Excited to try the recipe out! Thanks! Yes-it's powder and I changed that:)happy baking! When you say coconut milk, are you talking about regular or light coconut milk in a can or something like So Delicious coconut milk?